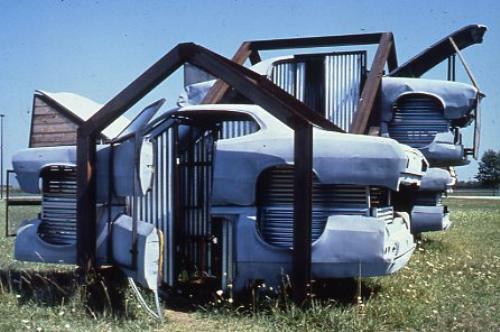 The artist built housing complexes with junk cars that had been gutted and then welded together. 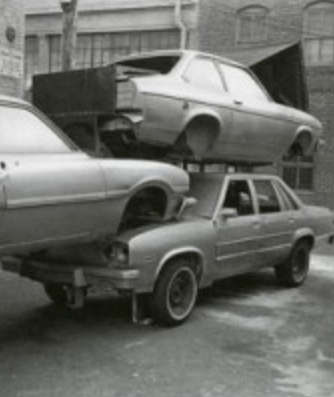 The original 1983 version was four battered, painted cars, stacked two-high in an abandoned vacant lot in San Francisco. Acconci's upgraded designs for living on the streets are biting commentaries on gentrification and urban reality. He never considered the works as models but hoped they would be lived in. To create real, usable housing out of society's throw-aways. People could live in the car-houses for free.